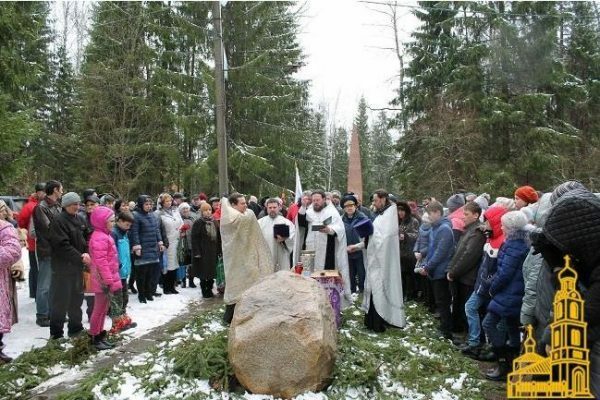 Moscow, March 31, Interfax - A site for building St. George Chapel was consecrated near the village of Novosyolovo in the Vladimir Region where first cosmonaut Yury Gagarin crashed. Dean of the Kirzhach District Archpriest Dimitry Yershov conducted the consecration, among those who attended the ceremony were twice heroes of the Soviet Union cosmonauts-pilots Alexey Leonov and Boris Volynov, first woman cosmonaut and hero of the USSR Valentina Tereshkova, the deanery press service reported. The chapel will be built near the memorial to Gagarin and his pilot instructor Vladimir Seryogin opened in 1975. A monument consists of a 16-meter wall in form of an aircraft wing made of red granite. Portraits of Gagarin and Seryogin are carved on the front side. MIG-112 aircraft, an exact copy of the plane in which they started for their last flight, is also installed on the memorial. St. Andrew Church built in 1825 is located nearby.